Suggested for: Skin subject to exfoliation Effect: Anti-dandruff .How to use: Wash carefully the hair then apply a sufficient amount of product in proportion to the hair length Leave in for a few minutes then rinse Two active principles against the dandruff: Climbazole a molecule with strong anti-dandruff activity highly effective and well tolerated by the skin and Piroctone Olamine which reduces a tendency towards excessively exfoliating the scalp. 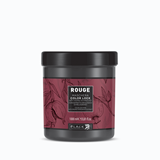 Formulated with cocoa extract and keratin, acts deeply, disentangles and disciplines hair, bringing intense softness without weighing hair down. The active princeples penetrate the hair fibre, restoring brightness and vitality. Visibly enhances combing and thanks to its light texture it is suitable for daily use. 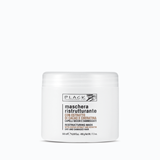 Absolute Blond Mask revitalises blond hair thanks to its purple pigments: over time, light-coloured hair tends to lose shine, vitality and tone. Designed to counteract unsightly yellow tones, this mask by Black Professional revives colour, restoring nourishment and shine. 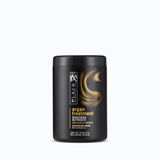 The Organic Almond Extract contained in the formula has nourishing properties and results in white, blond or discoloured hair that is shiny and full of volume.